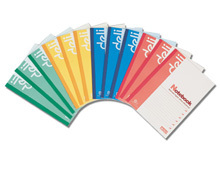 Notepad (note paper), sticky note, notebook and other paper supplies can all be found here. Deli Stationery specializes in office supplies. our product ranges from file keeper, file box and file bag to staple and stapler. from paper cutter to pencil sharpener. form writing instruments to paper products etc. Welcome to choose our office supplies. 1. Material: imported PP material. Pure wood pulp paper. 2. Note paper boxes are also available: transparent box or sky blue box. Notepads (note paper)are regularly used to keep some memo or massages. As a China office supply wholesaler and manufacturer, Deli Stationery mainly provides pocket calculator, paper shredder and adhesives. The picture shown left is our notepad. If you click the icons below this picture, you will find other related products. They can meet your different needs in office, school or at home. Welcome to choose! Thanks! Office Products1. Our whiteboard, whose functions are similar to blackboard, is suitable for teaching, conference discussion. Specialized whiteboard marker should be used.